Paralinx is dedicated to making cutting-edge gear accessible to all levels of filmmaking professionals and providing unparalleled customer support. The motion picture industry's first affordable yet professional wireless HD system. Uncompressed 4:2:2 1920x1080 10-bit video. Less than 2 ms latency. Range of over 300ft line-of-sight. Runs on 5V power. Transmitter weighs less than 40 grams. FCC, CE, and ROHS certified. HDMI input/output. Plug and play--no set-up required. The Arrow Plus multicast system combines all the features of the Arrow with the added ability to pair each transmitter with up to four receivers. Uncompressed 4:2:2 1920x1080 10-bit video. Less than 2 ms latency. Range of over 300ft line-of-sight. Runs on 5V power. Transmitter weighs less than 40 grams. HDMI input/output. FCC, CE, and ROHS certified. Plug and play--no set-up required. The Tomahawk has a range of up to 2000 feet (600m) with default antennas (longer range with optional antennas) and still maintains an incredible sub 1ms latency glass to glass. Both the Transmitter and Receiver feature 2-Pin Lemo power connectors capable of a wide 7-17V unregulated input voltage. The Paralinx Crossbow is an HD-SDI module to be used in conjunction with the Paralinx Arrow or Arrow Plus transmitter. The Crossbow converts an HD-SDI input signal to HDMI output and both the cross-converter and the Arrow/Plus transmitter (not included) draw power through the built-in Regulator. PTap/DTap or 2-pin Lemo power cables are available as accessories. The perfect way to mount a Paralinx Arrow/Plus transmitter to your camera! Attach the custom-made machined-delrin Shield to an articulating arm using the included 1/4-20 or 3/8'' screw holes or tighten the Shield down to your camera body with a 3/8'' bolt through the side rail. Custom-made power cable to regulate 12v D-Tap power to female USB with 5 volts at 2.1 amps. 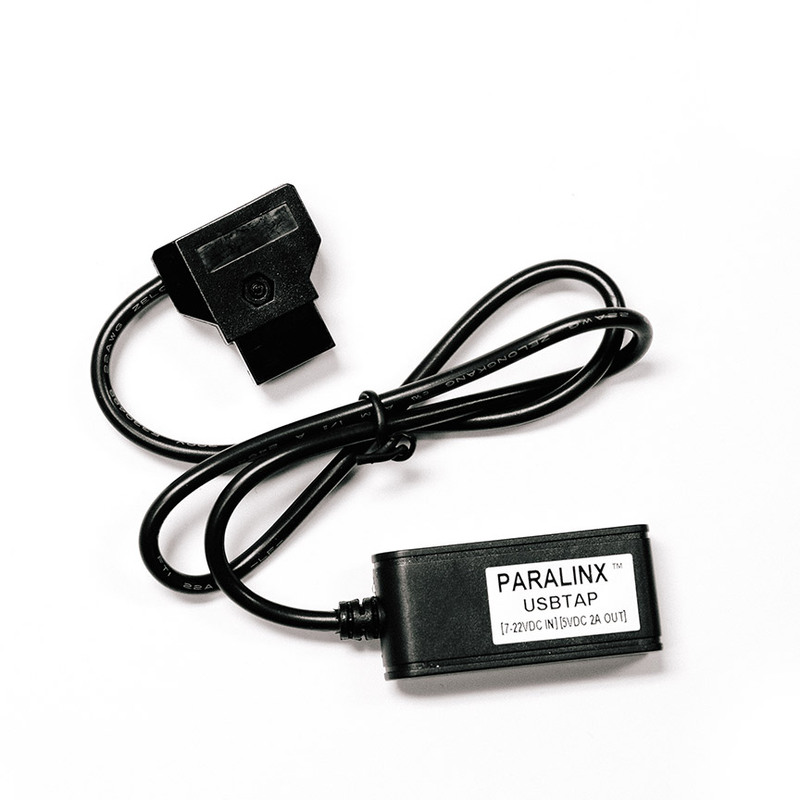 Powers your Paralinx Arrow Receiver or Transmitter. Extremely lightweight and, as a bonus, you can quickly recharge a REDMOTE or any USB-powered tablet or cell phone via a D-Tap power port. Regulates 7-22v DC in.